Open Joint Stock Company “V.A.Degtyarev Plant” is one of the largest enterprises of Russia and the largest enterprise of the Vladimir region. Founded in Kovrov in 1916 the machine-gun plant has been providing the Armed Forces of the country with infantry and gun weapons for over 80 years. 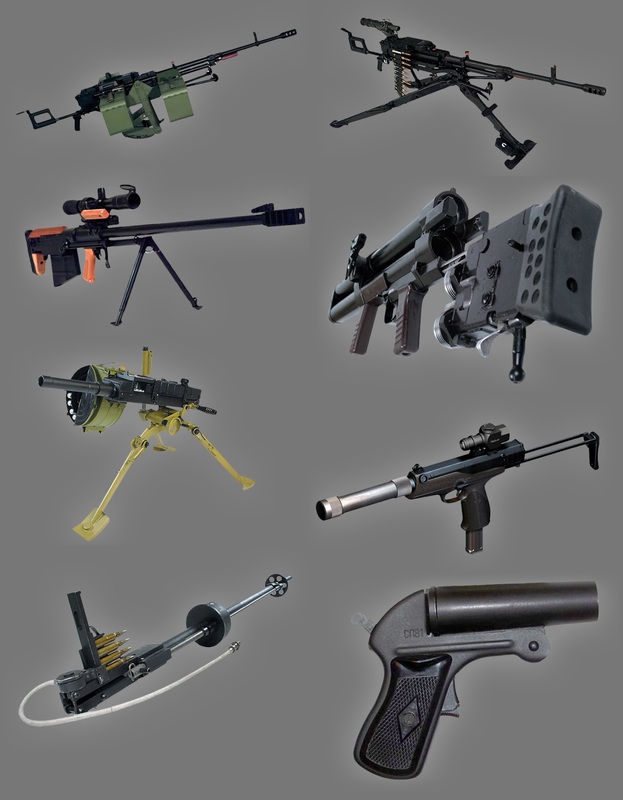 Weapons such as Degtyarev antitank rifle (PTRD), Degtyarev infantry machine-gun (DP), Shpagin machine pistol (PPSh), Goryunov heavy machine-gun (SG) were manufactured at the plant. During last years OJSC “V.A.Degtyarev Plant” has been producing the revolver “UDAR”, the machine-gun “KORD”, the aircraft guns “GSh-23” and the “GSh-30”, mount “98U” for fight with underwater diversions, the antitank system “KORNET-E”, the portable anti-aircraft missile system “IGLA”, etc. The nomenclature of civil production includes the wide scale of motor products, automatic curds packer M6-AR2T. According to the results of 1998 OJSC “V.A.Degtyarev Plant” is on the 127th place in sales volume and on the 5th place in profit volume in Russia. KORD 12.7 mm machine-gun - It is designated for the defeat of lightly armoured targets, fire installations and living force of enemy at the distances of up to 1500-2000m and for the defeat of air targets at slant distances of up to 1500m. 6П60 12.7 mm machine-gun on infantry mount 6Т20 - It is designed for defeat of lightly-armoured ground targets, vehicles and group living force at the distance of up to 2000 m. 12.7 mm machine-gun on bipod 6T19 (index 6П57), installed on infantry mount 6T20 (index 6П60), ensures firing in vertical and horizontal surfaces, in a lying position, on a knee and standing in a trench. 12.7 mm sniper systems 6C8, 6C8-1 - They are designed to fulfil special firing tasks for defeat of light-armoured and non-armoured arms and military vehicles as well as living force located openly including living force in individual protective means and also for defeat of isolated, multiple targets and other technical means at the distances of up to 1500 m.
Round 3UBK20 with guided missile 9M119M - It is a round of separate loading, designed for defeat of armoured vehicles including ones equipped with dynamic protection, small size targets of firing emplacement of fortified emplacement type, low-flying attacking air targets with low speed and targets which are over water surface. Round 3UBK14F with 9M119F guided missile of high explosive action is a round of separate loading intended for defeat of enemy personnel located openly on the terrain, sheltered in different installations and objectives as well as for damage or destruction of these objectives when the missile hitting inside them. DP64 Hand-held Grenade Launcher - It is designated for protection of submarines in the above-water position, ships at external roadstead, anchor stops and bases, for protection of water-development works and other sea and coastal installations against attacks of underwater combat swimmers. AGS-30 30 mm antipersonnel automatic grenade launching system - The small mass of the grenade launching system (which is twice as less of its analogue AGS-17) with a considerable set of combat ammunition allows to reduce the servicing crew. Small dimensions of the system, design peculiarities of the mount ensure the possibility of quick change of the firing position, firing from window openings and unprepared positions. Kashtan 9mm AEK 919K submachine gun - It is intended to suppress and engage hostile personnel at a range of up to 100m. It is used to equip special units executing combat tasks and combat vehicles crews. The automatics operation of the submachine gun is based on the use of free-bolt recoil principle. 2X35 Inserted unified self-loading gun - It is designed for carrying out exercising and training fire without basic ammunition expense equipped with the main systems with calibre of 125mm. The inserted gun is located in the loading breech and breech ring of the main system. BNT-Tvornica masina i hidraulike, D.D.